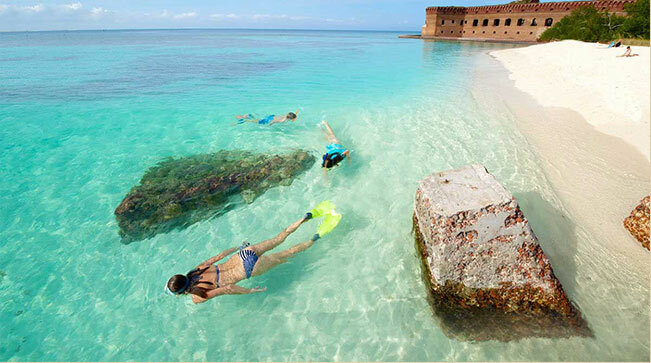 Meet Stephen Ippolito, our May 2018 #DryTortugas Photo Contest winner. We had the chance to ask him a few questions about his experience at the Dry Tortugas National Park. Read on to learn how he captured his amazing photo! I visited Dry Tortuga in April and took the Yankee Freedom ferry. The ferry trip was fantastic, it was a nice smooth and relaxing trip out to Dry Tortugas. I would definitely do it again. I specifically went out to Dry Tortugas for night photography because of its amazing dark skies away from light pollution. For this image, I setup my tripod on the moat right before the damaged section from last years hurricane and setup my Nikon D850 with my Nikon 14-24 f/2.8 lens to take continous 30 second exposures facing the North Star. This was done in order to capture the circular star trails as reflected in the image. The total elapsed time was approximately 1.5 hours of continuous images. I then took the hundreds of images and and merged them into one image using a software application called StarStax. As an aside, when I was reviewing the individual images, one of my very last images captured an amazing shooting star in center of frame which left a reflection on the water. I excluded that image from this star trail shot so that the shooting star streak wouldn't impact the final result. The amazing night skies, free from light pollution is a night photographers dream. A funny story, within 30 minutes of my arrival, when I was setting up my tent on a campsite, I hit my head on a low hanging tree branch (I will spare you the bloody details), but the Park Rangers stationed on Dry Tortugas and Ferry personel were fantastic and provided A plus level of help promptly. I plan to visit a few other National Parks, as I write this I am actually in Utah and will be visiting Arches National Park.